A New Orleans musician has a nightmare about killing a man in a strange house but he suspects that it really happened. When phony stage mentalist Triton mysteriously acquires supernatural powers of precognition, he becomes frightened and abandons his act to live of anonymity. After an overly aggressive district attorney unknowingly sends an innocent man to the chair, he resigns, turns to drinking, and acquires a criminal clientèle. In Montreal, a police inspector slowly discovers a plot to kidnap a nuclear physicist, American mobsters, foreign spies, and a blonde seductress, are all involved. Gangster Vincent Canelli and bank robber Peter Manning escape from Death Row minutes before their execution by electric chair. After being fished out of the sea by a sealer, three fugitives find themselves prisoners of the ship's brutal skipper who refuses to put them ashore and they hatch an escape plan during a crew mutiny. A beautiful psychology professor tries to hide a self-defense killing. A landlady suspects her new lodger is Jack the Ripper. A meek milquetoast of a clerk is mistaken for Public Enemy #1, and the notorious killer takes advantage of the situation. In New York, the murder of a Bellvue Hospital intern prompts the police to send an undercover detective to investigate. A man dreams he committed murder, then begins to suspect it was real. Johnny Damico botches a murder case and is suspended from the force. In reality, he is put undercover to identify the mysterious boss of the NY waterfront who has murdered everyone in his way. Will Johnny be next in line? Chicago reporter P.J. McNeal re-opens a ten year old murder case. Beware ! These are the eyes of a hypnotist ! In the late 1940s, director Maxwell Shane made a very low budget psychological thriller called Fear in the Dark -- about a man waking from a nightmare that he's murdered a stranger, only to find it to be true. 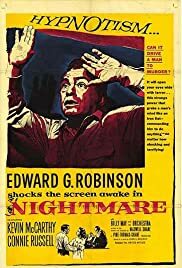 In 1956, Shane decided to remake it as Nightmare, with a name cast (Kevin McCarthy -- Mary's brother, for the record -- as the luckless dreamer, Edward G. Robinson as his brother-in-law the homicide cop). It's a very close remake, not as pointlessly literal as Gus Van Sant's cloning of Psycho, but with little changed except a better and more integrated jazz score. In sum, Nightmare boasts better acting and better production values, all of which serve to point up the basic cheesiness of the plot. The earlier version, looking a lot like a nightmare itself, lends its own low-rent integrity to Cornell Woolrich's bizarre vision. 15 of 16 people found this review helpful. Was this review helpful to you?